Old tractors, according to Mr. Antique Power Gal, are like women – you have to keep fooling with them all the time if you want them to work. 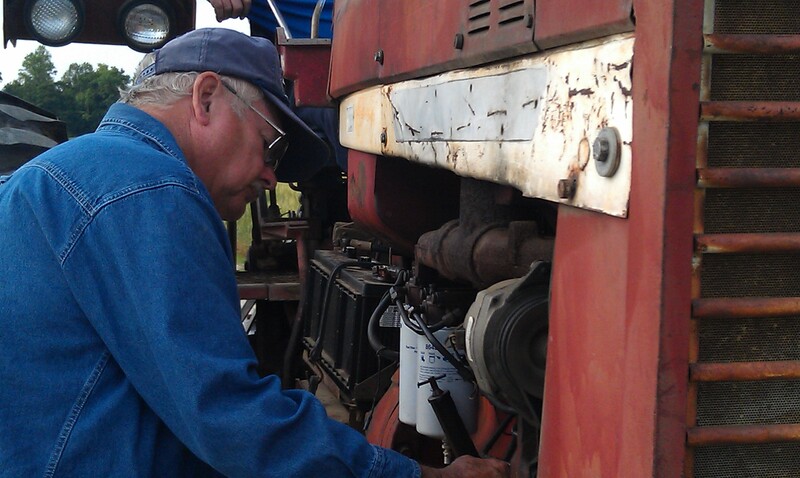 A certainty with vintage tractors is that they need constant care and tinkering to run smoothly. That’s part of their charm. 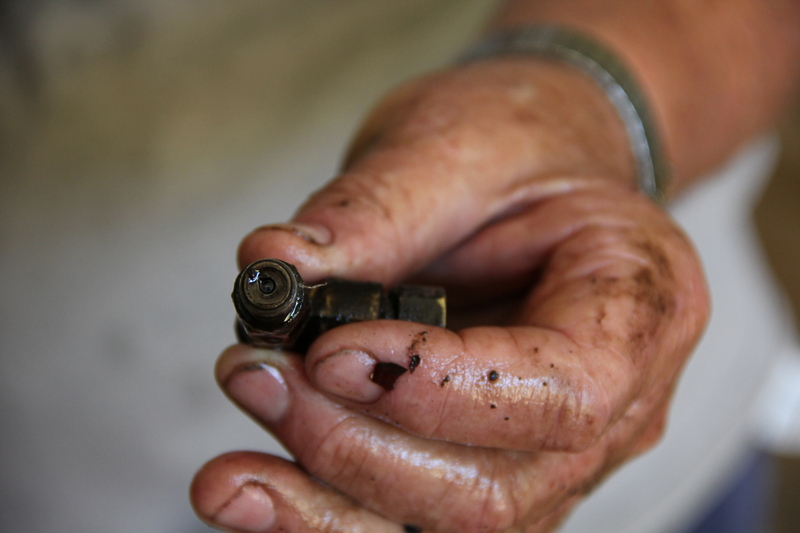 Each tractor owner knows the secrets to keeping his tractors going. 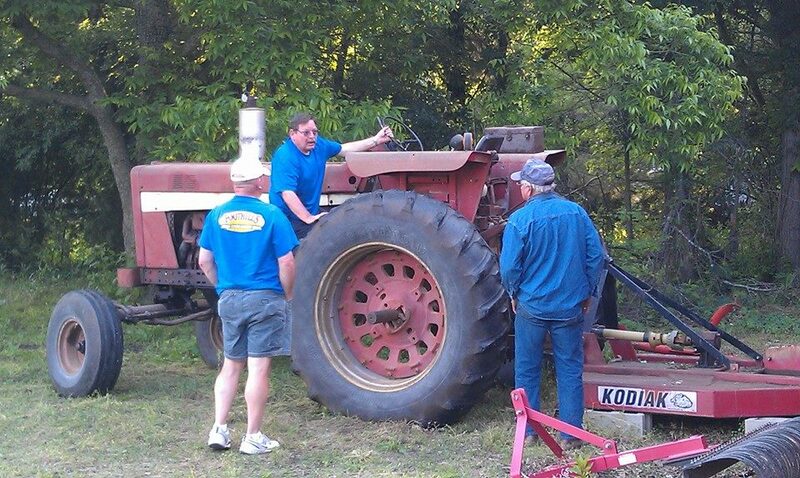 Tractor people are good folks, always ready to lend a hand to a fellow tractor nut enthusiast in need. 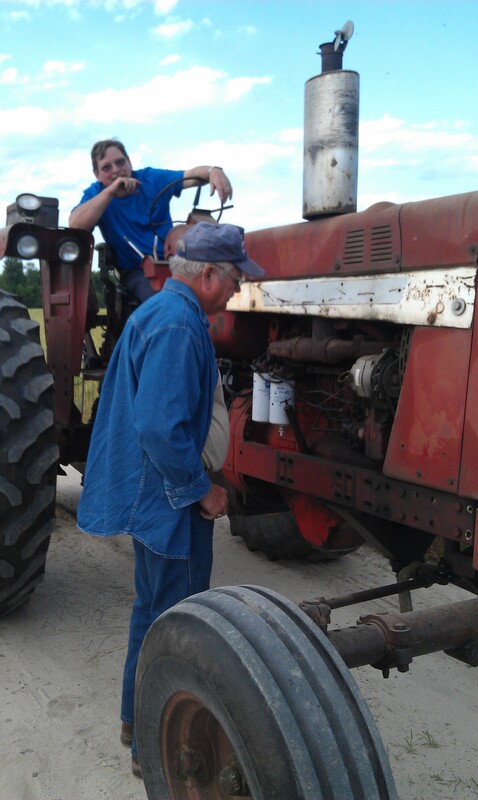 Because tractors are going to break down, it is very handy to have a mechanical genius for a friend. Our mechanical genius is Junior. He can fix anything. Under the shade trees in his yard, many mechanical mysteries are solved. I am pretty sure he could fix the country if given some time in the Oval Office. 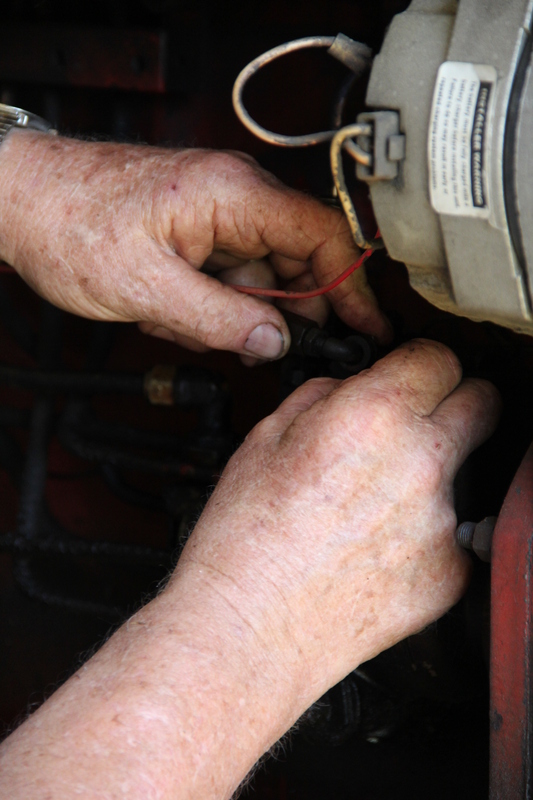 Junior comes to our rescue on a regular basis, and John repays by fixing Junior’s A/C. If you do not have a Junior in your life, you must find one. You can’t have ours! On one particularly fine day in May, we fired up the International Harvester 856 (AKA the hussy) to take it across the street to bush hog around our neighbor’s pond. It fired right up, made it across the street to the back of the farm, and began to run out of power. John turned it around to come back down the dirt road and got about fifteen feet down the 1/3 mile road. The hussy had stopped completely. He let it set for about five minutes and fired it back up. He started forward again. And made it about another fifteen feet. Another five minutes, another fifteen feet. It looked like the half-mile trip home would take several hours. This is when a cell phone comes in handy. Junior was there in a matter of minutes. Thank heavens, because John was making me tap on stuff with a wrench. I just tapped random parts until Junior showed up. Within five minutes, he had the hussy on a temporary fix. 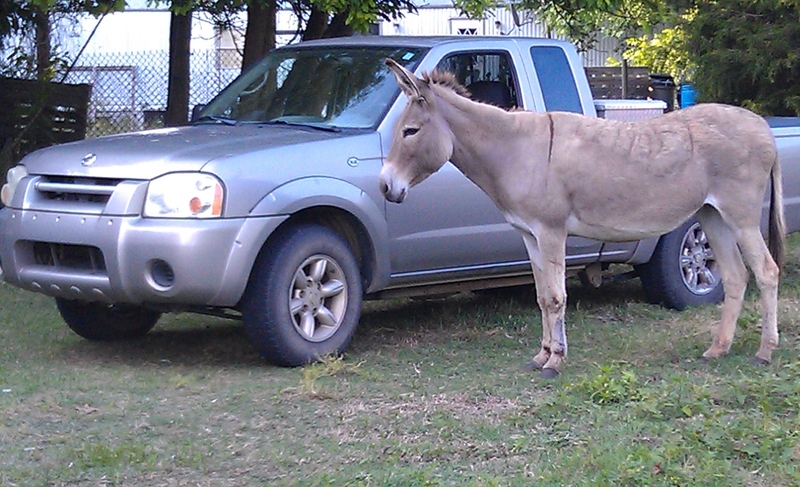 As any expert does, Junior made it look so easy; he just loosened a little something and we managed to get her home. That’s what experts do. They know what to do when the rest of us are clueless, and they work so skillfully that we lose sight of the truth that what seems easy comes with experience, knowledge, and practice. We lost a little fuel, but we didn’t have to explain to the family who lives on the farm why they would not be able to get to the work in the morning due to a tractor blocking the road. The hussy is up and running now. The check valve in the return line was stuck. It was a fairly simple fix. The point is – friends help friends in time of need. Oh, and Junior plays a pretty mean guitar. The back-up antique power source is ready if we need any advice or assistance.